It’s time to announce the Genuine Health dermalipid winner. A big thanks to all of those who entered, with their skin care tips and tricks. I’d say wearing sunscreen and getting lots of fluids were some of the most popular skin care tips. If you want to browse through everyone’s suggestions, please go back and visit the contest thread. Now it’s time to see who is the lucky winner of a one month supply of dermalipid. 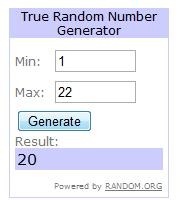 There were a total of 22 entries (including links back and tweets). Upon consultation of Random.org, I was presented with the lucky number. Caitlin, please email me with your mailing address so I can pass it along to Genuine Health, and they’ll get your prize out to you ASAP. Although, I did get a Derma Lipid brochure at the show and there is a link to sign up for a free one month sample. So I did that instead. Hopefully I get one. I will find out in 6-8 weeks!